I cut an unnecessary branch and the branch which weakened and I control growing power of a tree and keep a fixed size of the tree. It seems to be simple, but is important work to greatly control the quality of fruit of the year. Nourishment is absorbed by an apple, and the soil gets sterile every year. Thus, I do manure and compost to do it in a soil state suitable for the growth of the apple and wind up lime for correction of the soil which became acid. There is a property called the cross-fertilization not to be fertilized even if the apple produces the pollen of the same kind on a pistil. 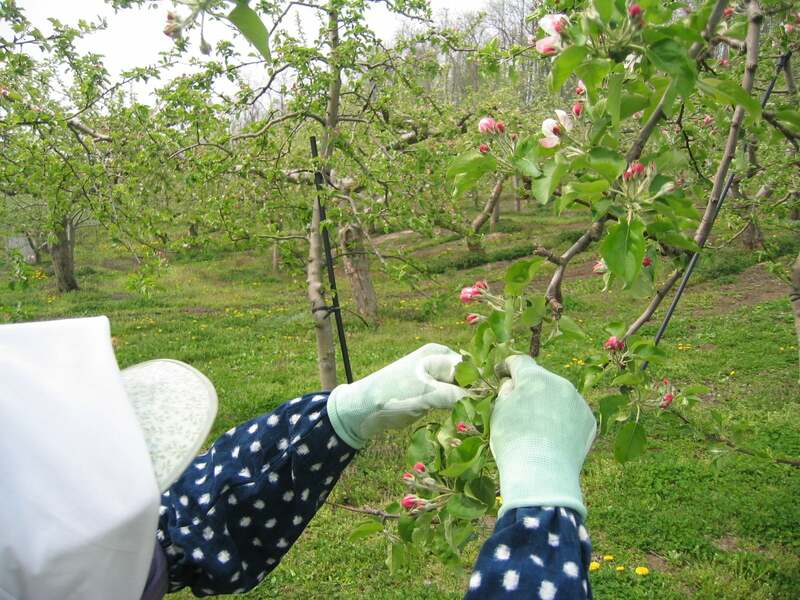 Thus, I do the artificial pollination to crossbreed using a cotton swab by hand of the person when the flower of the apple blooms. 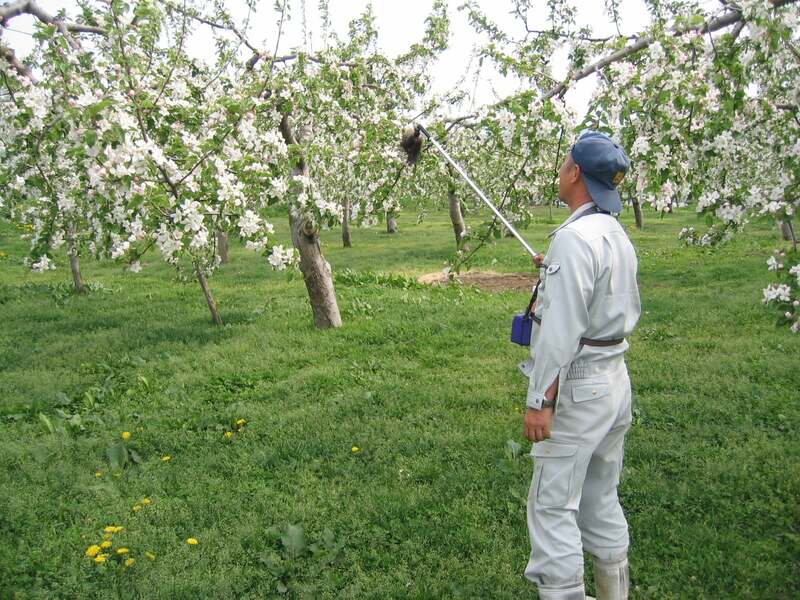 However, this work gave off hohanakommushi called the mameko bee recently in apple garden to need considerable labor, and farmhouses to crossbreed increased. 5.6 flowers bloom in the apple from the bud of one flower. It is only a thing fertilized to a flower called the disk flower of the middle that a good apple of inner kakei grows. Thus, I all pick the unnecessary flower to prevent waste of the nourishment. In addition, the apple cannot let it all become even if I do one to become. I let too much you become, and a burden hangs over the tree more, and an enhancement degree of the flowering sprout in the next year decreases. An apple becomes small by competition of the nourishment between the fruit by letting you become a lot, and quality, the taste decreases, too. 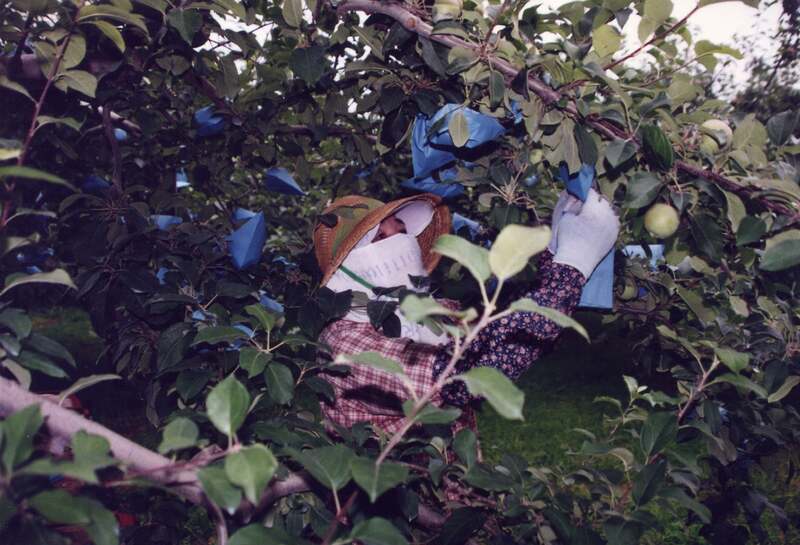 The purpose with a bag over an apple was to protect an apple from a pest, but became able to originally deal by drug dispersion with the progress of the drug enough. The bag hook goes now to make the coloration of the apple better. If it becomes about time when this, an apple is enlarged, and a branch falls down. I give the branch which I hung down with a prop to break a branch, and to expose an internal leaf to prevention and sunlight enough. When the temperature lowers when it is the end of August, and minimum temperature comes to be less than 15 degrees Celsius, coloration management of premature delivery class "Tsugaru" begins. I spread a silver reflection seat letting the ground reflect light that the thing which I hang a bag and did does removal of bags and takes the leaf of the crane cause, and to lose a part not to color in the shades such as branches, and to do a ball mawashi (turning an apple to where the day consults the place where I do not color as the state that let an apple become) to let you color the whole fruit, and to push forward the coloration still more. In addition, it is mixed up with the crop of the premature delivery class, and the coloration management such as the removal of bags, leaf collecting of average, the late ripening kind is pushed forward at the same time, and it is at time busy most in one year. 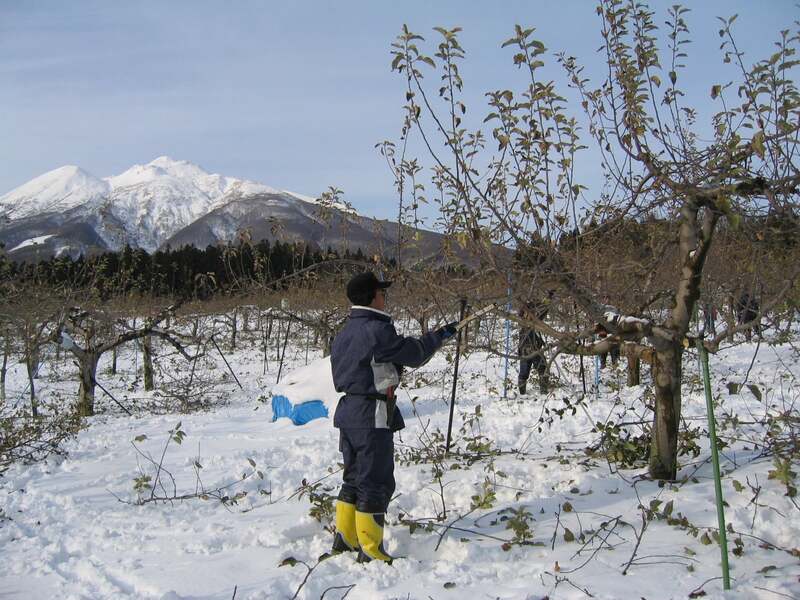 The apples which carry out various activities, and were brought up are harvested with the early thing from August. I harvest it with caution not to take the string not to injure an apple. When November begins, and it begins to begin to snow, clearing is performed before a full-scale snowfall in the post-harvest garden. 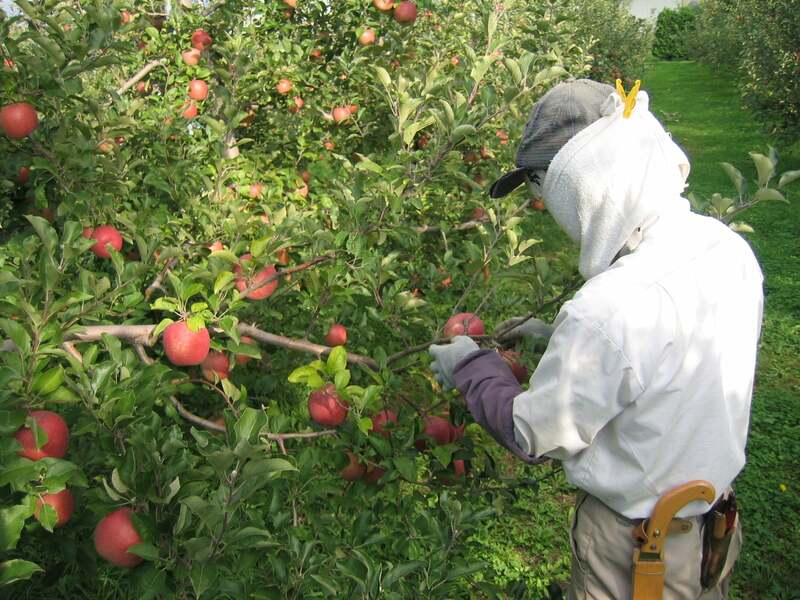 The main work puts material used in growth and the harvest of apples in order and is got rid of the mouse.